FAMOUS MATHEMATICIAN - John Napier of Merchiston; also signed as Neper, Nepair; nicknamed Marvellous Merchiston was a Scottish landowner known as a mathematician, physicist, and astronomer. He was the 8th Laird of Merchiston. His Latinized name was Ioannes Neper. 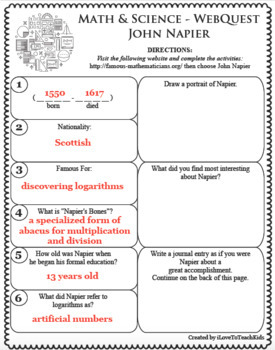 John Napier is best known as the discoverer of logarithms. 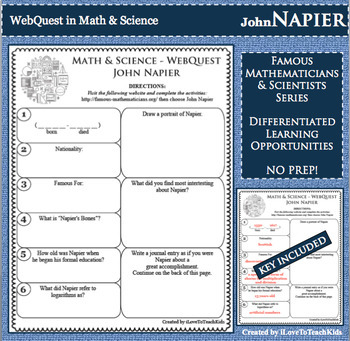 Engage your learners in fun, interactive, and creative ways to discover more about JOHN NAPIER using this WebQuest. Activity is differentiated allowing students to respond to open-ended questions reaching individual levels. INSPIRE your students!